DIY Recipes: Because Who Wants to Consume Chemicals? One thing that troubles me most is the amount of junk in our foods. Seriously, there are so many chemicals and preservatives in our foods that they are literally making us fat and sick. Some of these additives are so bad for you they are even banned in other countries (WHAT?! yeah, disturbing, right?). I have recently become pretty obsessed with almond milk, thanks to my strong disbelief in soy products and the desire to avoid excessive dairy. I even use this stuff in my homemade lattes— just dump it straight into my nespresso and within a couple minutes I have almondy-latte goodness. Soak 1/2c of almonds overnight in water (I just fill up a mason jar and put them in there). Add 1c fresh water + almonds to a blender and give it a good whirl. I normally will let it go for about 45 seconds, give it a break, and then another round of 45 seconds. Strain your new mixture using a cheese cloth (good to make sure it’s at least doubled up) or using a nut milk bag (OMG I can’t wait to get one of these). ENJOY! Keep refrigerated. People say it lasts about 3 days, but I normally finish mine in that time, so I haven’t seen it go bad. If you want to add some flavor, feel free to add some vanilla bean, blend in some dates for sweetness, and sometimes I add a hint of cinnamon to my lattes. That wasn’t so bad, was it? Let’s carry on. I started making my own mayo when I did the whole30, and I don’t know why people don’t do this more. It takes literally 2 minutes and it is so much better than store bought, and so much healthier! Stick an immersion blender (if you don’t have one, I highly recommend, especially if you like making soup!) into your mixture and turn that baby on. Leave it in there for 30 seconds and watch in amazement as mayo appears before your little troublemaking eyes. Enjoy on sandwiches, make your own chicken salad, or use however else you use mayo! I am not going to lie— I love chocolate. And I love chocolate milk. And mocha lattes. Pre-whole30 I drank chocolate milk after every work out. I need to get back to that, but I am trying to reduce sugar. The point is, if you are going to consume chocolate syrup, make it yourself! SO delicious and no junk, and it lasts for months. Store in fridge, and savor every moment. 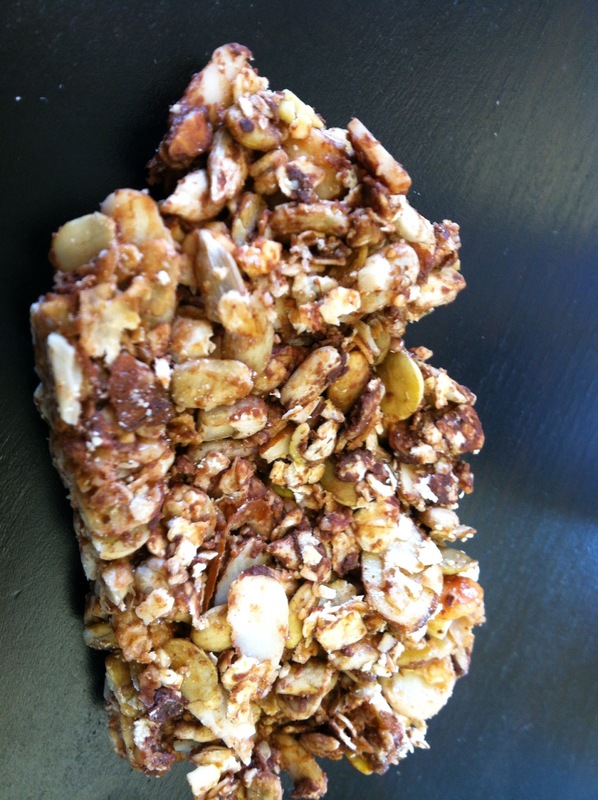 I love granola bars, but so often they are chock full of stuff I have never heard of. Why do I need soy protein isolate (which actually triggers my migraines) in a granola bar? The gig’s up, Quaker, these trouble maker does it herself. Add any types of nuts and seeds you like to a baking dish along with 2 cups oats, and toast them in the oven on 350 for 5 minutes. I generally use pecans or almonds, pepitas (spicy are good! ), sunflower seeds. Feel free to add those extra healthy ones like flax and chia seeds too! You should have about 2 cups total of the nuts. You could even make these without oats if you are paleo. While those are hanging out in the oven, mix up the following in a pot and bring to a boil, then turn off: 1/4 cup brown sugar, 1/4 cup honey, dash of salt, dash of vanilla, dash of cinnamon (optional). Sub more honey for the brown sugar if you are paleo. When both are ready, mix it up! At this point I also like to add chocolate chips and they melt through, so you only need about 1/4 cup or less. But that’s optional too! Spread evenly on baking pan on top of wax paper, bake at 350 for about 30 minutes or until golden brown. Have you noticed something here? All these recipes are super fast, and super delicious, and, dare I say, much better for you. I am not saying to eat mayo and chocolate syrup at every meal, but I do feel strongly that it’s worth doing some of these DIY for products you consume anyways because they don’t contain all the gunk you’d be contaminating your body with. Not to mention they all taste EXPONENTIALLY better and might even save you some cash. Everyone wins! Let me know what you make, and how it turns out. Or what products you DIY/want me to figure out a recipe for. Let’s cause some necessary trouble to the food industry by refusing to consume the junk they are trying to feed us.